Hip dysplasia is an abnormal formation of the hip socket that, in its more severe form, can eventually cause crippling lameness and painful arthritis of the joints. It is a genetic (polygenic) trait that is affected by environmental factors. It can be found in many animals and in humans, but is most commonly associated with dogs, and is common in many dog breeds, particularly the larger breeds such as the German Shepherd. In the normal anatomy of the hip joint, the root (the thigh bone) is connected to the pelvis at the hip joint. The almost spherical end of the femur head (the caput, or caput ossis femoris) fits into the acetabulum (a concave socket located in the pelvis). The bony surface of the femur head and of the acetabulum are covered by cartilage. While bones provide the strength necessary to support body weight, cartilage ensures a smooth fit and a wide range of motion. Normal hip function can be affected by congenital conditions such as dysplasia, trauma, and by acquired diseases such as osteoarthritis and rheumatoid arthritis. In a hip suffering from dysplasias, two things are commonly abnormal. First, the caput is not deeply and tightly held by the acetabulum. Instead of being a snug fit, it is a loose fit, or a partial fit. Secondly, the caput or acetabulum are not smooth and round, but are misshapen, causing abnormal wear and tear or friction within the joint as it moves. The body reacts to this in several ways. First, the joint itself is continually repairing itself and laying down new cartilage. However, cartilage repair is a relatively slow process, the tissue being avascular. So the joint may suffer degradation due to the abnormal wear and tear, or may not support the body weight as intended. The joint becomes inflamed and a cycle of cartilage damage, inflammation and pain commences. This is a self-fueling process, in that the more the joint becomes damaged, the less able it is to resist further damage. The inflammation causes further damage. The bones of the joint may also develop osteoarthritis, visible on an X-ray as small outcrops of bone, which further degrade the joint. The underlying deformity of the joint may get worse over time, or may remain static. A dog may have good X-rays and yet be in pain, or may have very poor X-rays and have no apparent pain issues. The hip condition is only one factor to determine the extent to which dysplasia is causing pain or affecting the quality of life. In mild to moderate dysplasia it is often the secondary effects of abnormal wear and tear or arthritis, rather than dysplasia itself, which is the direct causes of visible problems. A Labrador Retriever standing with hind legs close together to compensate for hip dysplasia. In canines, it can be caused by a femur that does not fit correctly into the pelvic socket, or poorly developed muscles in the pelvic area. Large and giant breeds are most susceptible to hip dysplasia (possibly due to the BMI of the individual animal), though, many other breeds can suffer from it. Cats are also known to have this condition, especially Siamese. To reduce pain, the animal will typically reduce its movement of that hip. This may be visible as “bunny hopping”, where both legs move together, or less dynamic movement (running, jumping), or stiffness. Since the hip cannot move fully, the body compensates by adapting its use of the spine, often causing spinal, stifle (a dog’s knee joint), or soft tissue problems to arise. The causes of hip dysplasia are considered heritable, but new research conclusively suggests that environment also plays a role. To what degree the causality is genetic and what portion environmental is a topic of current debate. Environmental influences would include overweight condition, injury at a young age, overexertion on hip joint at a young age, ligament tear at a young age, repetitive motion on forming joint (i.e. jogging with puppy under the age of 1 year). As current studies progress, greater information will help provide procedures to effectively reduce the occurrence of this condition. In dogs, the problem almost always appears by the time the dog is 18 months old. The defect can be anywhere from mild to severely crippling, and can eventually cause severe osteoarthritis. It is most common in medium-large pure bred dogs, such as Newfoundland Dogs, German Shepherd Dogs, Labrador or Golden retrievers, rottweilers and mastiffs, but also occurs in some smaller breeds such as spaniels and pugs and occasionally (usually with minor symptoms) in cats. Atrophy of thigh muscle after a two-year evolution of hip dysplasia. 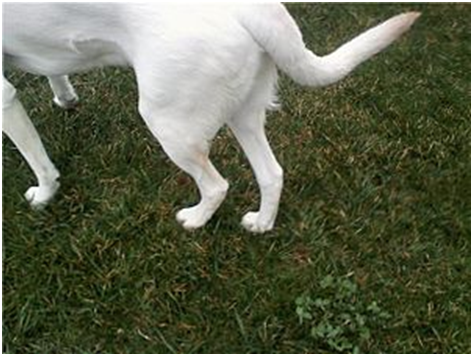 Dogs might exhibit signs of stiffness or soreness after rising from rest, reluctance to exercise, bunny-hopping or other abnormal gait (legs move more together when running rather than swinging alternately), lameness, pain, reluctance to stand on rear legs, jump up, or climb stairs, subluxation or dislocation of the hip joint, or wasting away of the muscle mass in the hip area. 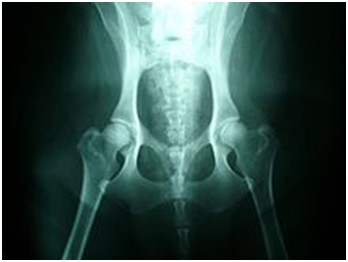 Radiographs (X-rays) often confirm the presence of hip dysplasia, but radiographic features may not be present until two years of age in some dogs. Moreover, many affected dogs do not show clinical signs, but some dogs manifest the problem before seven months of age, while others do not show it until well into adulthood. In part this is because the underlying hip problem may be mild or severe, may be worsening or stable, and the body may be more or less able to keep the joint in repair well enough to cope. Also, different animals have different pain tolerances and different weights, and use their bodies differently, so a light dog who only walks, will have a different joint use than a more heavy or very active dog. Some dogs will have a problem early on, others may never have a real problem at all. Each case must be treated on its own merits, and a range of treatment options exist. A dysplastic animal has probably lived with the condition since it was only a few months old, and has therefore grown up taking the chronic pain for granted and has learned to live with it. Dogs suffering such pain do not usually exhibit acute signs of pain. Sometimes, they will suddenly and abnormally sit down when walking, or refuse to walk or climb objects which they usually would, but this can equally be a symptom of many other things, including a thorn in the paw, or a temporary muscle pain. So pain recognition is less common a means of detection than the visible gait and other abnormalities described above. The classic diagnostic technique is with appropriate X-rays and hip scoring tests. These should be done at an appropriate age, and perhaps repeated at adulthood – if done too young they will not show anything. Since the condition is to a large degree inherited, the hip scores of parents should be professionally checked before buying a pup, and the hip scores of dogs should be checked before relying upon them for breeding. Despite the fact that the condition is inherited, it can occasionally arise even to animals with impeccable hip scored parents. In diagnosing suspected dysplasia, the x-ray to evaluate the internal state of the joints is usually combined with a study of the animal and how it moves, to confirm whether its quality of life is being affected. Evidence of lameness or abnormal hip or spine use, difficulty or reduced movement when running or navigating steps, are all evidence of a problem. Both aspects have to be taken into account since there can be serious pain with little X-ray evidence. It is also common to X-ray the spine and legs, as well as the hips, where dysplasia is suspected, since soft tissues can be affected by the extra strain of a dysplastic hip, or there may be other undetected factors such as neurological issues (e.g. nerve damage) involved. There are several standardized systems for categorising dysplasia, set out by respective reputable bodies (Orthopedic Foundation for Animals/OFA, PennHIP, British Veterinary Association/BVA). Some of these tests require manipulation of the hip joint into standard positions, in order to reveal their condition on an X-ray. 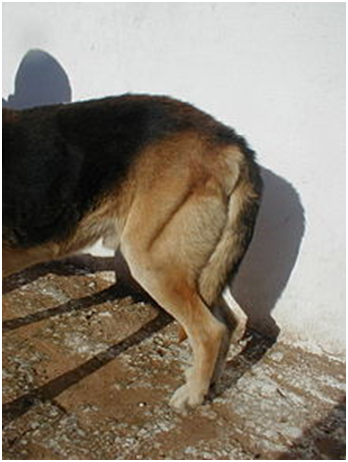 Osteochondritis dissecans and elbow dysplasia in the forelimbs are difficult to diagnose as the animal may only exhibit an unusual gait, and may be masked by, or misdiagnosed as, hip dysplasia. It is also worth noting that a dog may misuse its rear legs, or adapt its gait, to compensate for pain in the forelimbs, notably osteoarthritis, osteochondritis (OCD) or shoulder or elbow dysplasia, as well as pain in the hocks and stifles or spinal issues. It is important to rule out other joint and bodily issues before concluding that only hip dysplasia is present. Even if some hip dysplasia is present, it is possible for other conditions to co-exist or be masked by it. There is no complete cure, although there are many options to alleviate the clinical signs. The aim of treatment is to enhance quality of life. Crucially, this is an inherited, degenerative condition and so will change during the life of an animal, so any treatment is subject to regular review or re-assessment if the symptoms appear to get worse or anything significantly changes. If the problem is relatively mild, then sometimes all that is needed to bring the symptoms under control are suitable medications to help the body deal better with inflammation, pain and joint wear. In many cases this is all that is needed for a long time. If the problem cannot be controlled with medications, then often surgery is considered. There are traditionally two types of surgery – those which reshape the joint to reduce pain or help movement, and hip replacement for animals which completely replaces the damaged hip with an artificial joint, similar to human hip replacements. Non-surgical intervention is usually via a suitable non-steroidal anti-inflammatory drug (NSAID) which doubles as an anti-inflammatory and painkiller. Typical NSAIDs used for hip dysplasia include carprofen and meloxicam (often sold as Rimadyl and Metacam respectively), both used to treat arthritis resulting from dysplasia, although other NSAIDs such as tepoxalin (Zubrin) and prednoleucotropin (“PLT”, a combination of cinchophen and prednisolone) are sometimes tried. NSAIDs vary dramatically between species as to effect: a safe NSAID in one species may be unsafe in another. It is important to follow veterinary advice. A glucosamine-based nutritional supplement may give the body additional raw materials used in joint repair. Glucosamine can take 3–4 weeks to start showing its effects, so the trial period for medication is usually at least 3–5 weeks. In vitro, glucosamine has been shown to have negative effects on cartilage cells. It is also common to try multiple anti-inflammatories over a further 4–6 week period, if necessary, since an animal will often respond to one type but fail to respond to another. If one anti-inflammatory does not work, a vet will often try one or two other brands for 2–3 weeks each, also in conjunction with ongoing glucosamine, before concluding that the condition does not seem responsive to medication. Carprofen, and other anti-inflammatories in general, whilst very safe for most animals, can sometimes cause problems for some animals, and (in a few rare cases) sudden death through liver toxicity. This is most commonly discussed with carprofen but may be equally relevant with other anti-inflammatories. As a result it is often recommended to perform monthly (or at least, twice-annually) blood tests to confirm that the animal is not reacting adversely to the medications. Such side effects are rare but worth being aware of, especially if long-term use is anticipated. This regimen can usually be maintained for the long term, as long as it is effective in keeping the symptoms of dysplasia at bay. Some attempts have been made to treat the pain caused by arthritic changes through the use of “laser therapy”, in particular “class IV laser therapy”. Well-controlled clinical trials are unfortunately lacking, and much of the evidence for these procedures remains anecdotal. If medications fail to maintain an adequate quality of life, surgical options may need to be considered. These may attempt to modify or repair the hip joint, in order to allow pain free usage, or may in some cases completely replace it. Hip modification surgeries include excision arthroplasty, in which the head of the femur is removed and reshaped or replaced, and pelvic rotation (also known as triple pelvic osteotomy, or pubic symphodesis) in which the hip socket is realigned, may be appropriate if done early enough. These treatments can be very effective, but as a rule tend to become less effective for heavier animals – their ability to treat the problem becomes reduced if the joint has to handle more pressure in daily life. Pelvic rotation is also not as effective if arthritis has developed to the point of being visible on X-rays. Femoral head ostectomy (FHO), sometimes appropriate for smaller dogs and cats, is when the head of the femur is removed but not replaced. Instead, the resulting scar tissue from the operation takes the place of the hip joint. In such surgeries, the weight of the animal must be kept down throughout its life in order to maintain mobility. FHO surgery is sometimes done when other methods have failed, but is also done initially when the joint connection is particularly troublesome or when arthritis is severe. Hip modification surgeries such as these usually result in reduction of hip function in return for improved quality of life, pain control, and a reduction in future risk. Hip replacement has the highest rate of success, especially in severe cases, since it completely replaces the faulty joint. It usually restores complete mobility if no other joint is affected, and also completely prevents recurrence. Hip replacement for dogs, can sometimes also be a preferred clinical option for serious dysplasia in animals over about 40–60 lb (18–27 kg), a weight that excludes certain other surgical treatments. DARthroplasty (Dorsal Acetabular Rim arthroplasty) is a technique whereby cortico-cancellous bone strips, taken from the iliac crest, are contoured over the femoral head and sutured to the dorsal hip joint capsule and packed with additional cancellous bone graft dorsally to eventually anchor to drill holes in the original dorsal acetabulum. The new “shelf” eventually becomes an extension of the original acetabulum, thereby providing support and eliminating subluxation of the hip joint. The joint capsule becomes the new joint surface. Pubic symphysiodesis (also known as juvenile pubic symphysiodesis, or JPS), is a procedure for very young dogs that manipulates the way the pelvis grows to create a tighter hip. It involves cauterizing the growth plates of the pelvis, in other words, the part of the pelvis which would usually grow and spread in puppyhood, no longer does so. To compensate, the rest of the pelvis grows outward, in a manner which enhances the “socket” of the hip and provides better support than that dog would have had naturally. Since it relies on growth in puppyhood, it has a very tight window for surgery – currently no sooner than about 4 months and no later than about 5 months. This is compatible with hip scoring of puppies at 4 months. Capsular neurectomy is a procedure in which the hip joint capsule is de-nerved to reduce pain in the hip. This allows the dog to exercise moderately with less pain, thus preventing the leg muscles from weakening from disuse and providing less support to the bad joint. Both hips can be done at one surgery. This surgery should not prevent a future hip replacement, if a more complete fix is desired. In a recent comparative orthopedic study, a new bioscaffold having an embryonic-like structure has shown positive clinical outcomes in dogs with advanced, end stage osteoarthritis. The bioscaffold was implanted into intra-articular areas and reported up to 90-days of clinical improvement after a single implant. The bioscaffold has been shown to cause infiltrating cells to upregulate a variety of tissue repair factors including aggrecan, connective tissue growth factor, bone morphogenetic protein, transforming growth factors, and other tissue repair factors associated with osteoarthritis. There are many products available to help mobility in dogs suffering from hip dysplasia. These consist of pressure-reducing pet beds, ramps, stairs, and steps built with wood, plastic, metal, or foam that help the dog get from one place to another without causing pain or hurting themselves further. Hip hammocks have been tested and proven effective in aiding dogs suffering from hip dysplasia regain mobility.